ANDRIY.CO - Sync PDA via ActiveSync®. 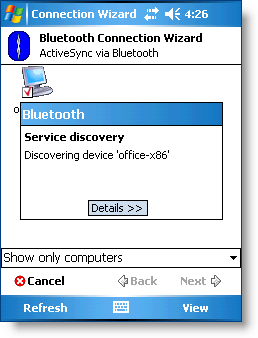 Setting up ActiveSync via Bluetooth. Step-by-step instruction. 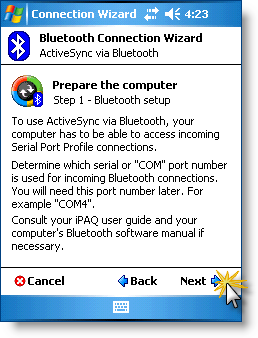 Sync PDA via ActiveSync®. 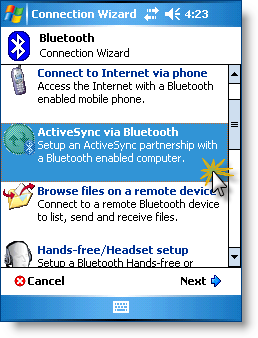 Setting up ActiveSync via Bluetooth. Step-by-step instruction. 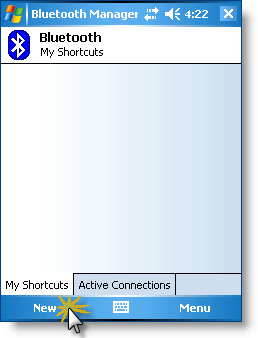 The article deals with how to configure the synchronization between the computer and mobile device that is running Windows Mobile®. Given the commonality of approaches to address this problem the article should not be regarded as highly specialized, referring only to devices with TCUMobile. It is designed to help all users who have difficulty in setting up the synchronization via ActiveSync®, including the Bluetooth. That is why the article is accompanied by a large number of screenshots, with detailed explanations. Even though the abundance of this information in the information space. Essence of synchronization between TCUMobile2 (application running on the mobile device) and the main accounting system is to exchange files with the data - when you update the database on the PDA of TTSU (the main accounting system) in the PDA is placed cut base Data TCUMobileBase.xml, using The following methods of synchronization, as if made of sales, order and payment from the PDA into the main accounting system files are loaded and nakl.xml list.xml, containing the information about the transactions. Transport for the exchange of data is to synchronize the mobile device with your PC using ActiveSync®, which, in turn, works with a company Exporter2 SoftKB. More information about configuring Exporter2 can be found in the Manuals TCUMobile2 . PDA, it is "PDA", he "PocketPC". Deliberately does not focus on the types of devices - communicator, smartphone, etc. 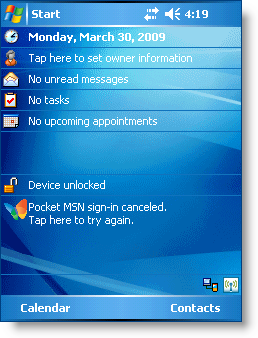 The device must run an operating system Windows Mobile® versions of all - 2002, 2003, 2005 and above. computer operating system Windows XP® and above. Cord (cable) to connect the PDA to the computer (from the kit to the PDA) - instructions for setting up synchronization , a fixed Bluetooth-Adapter - instructions for setting up synchronization . I. Synchronize PDA with your PC via cable. further will provide detailed instructions for setting up the synchronization. An example is given for the operating system Window XP®, and PDA HP2190 iPAQ c Windows Mobile® 5.0. So, ActiveSync® is installed. Click on the ActiveSync® icon in the notification area of the taskbar - open window. Fig. 1. 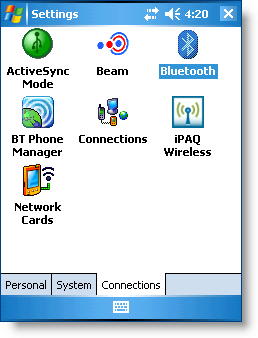 Windows ActiveSync® - waiting for connections. Connect the cord to the PDA. Badge program will become green and begin to rotate, as in a box appears "Connecting to"
Fig. 2. 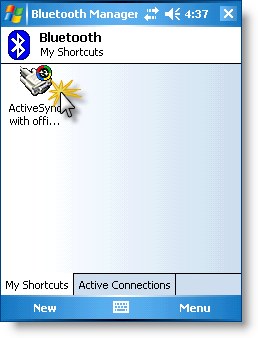 Windows ActiveSync® - Connecting. Fig. 3. ActiveSync® - recommendation to synchronize with Outlook. Fig. 4. 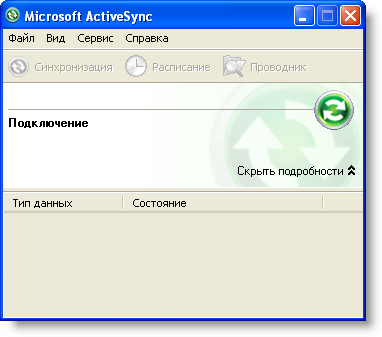 ActiveSync® - Wizard synchronization. Fig. 5. 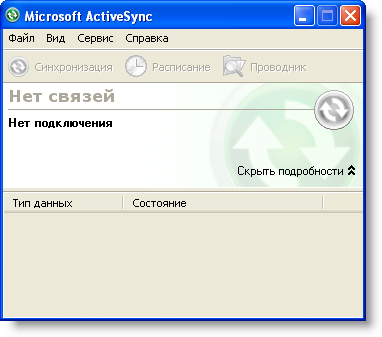 ActiveSync® - Wizard synchronization. Fig. 6. 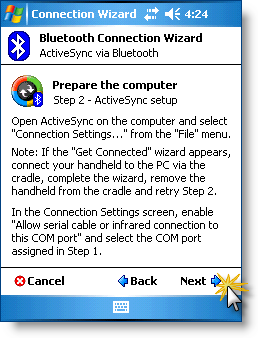 ActiveSync® - Wizard synchronization. Immediately after installation check box in the "Files" message appears. Click "OK"
Fig. 7. ActiveSync® - synchronize files. Fig. 8. ActiveSync® - Wizard synchronization. Fig. 9. ActiveSync® - the completion of the synchronization wizard. Fig. 10. ActiveSync® - Timing. Fig. 11. 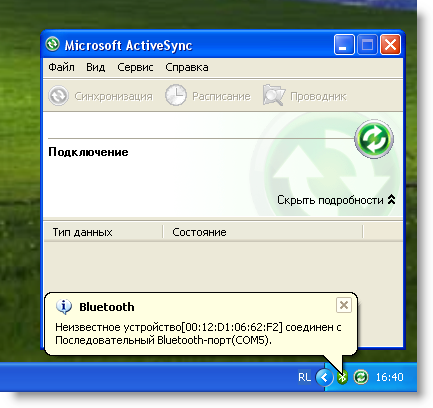 ActiveSync® - the synchronization is finished. When configured in this way synchronization of the exchange of files between folders "My Documents" of mobile devices and documents to WINDOWSMONILE29 "created on a computer specifically for your mobile device. If some mobile devices, each will create its own folder corresponding to the device name. 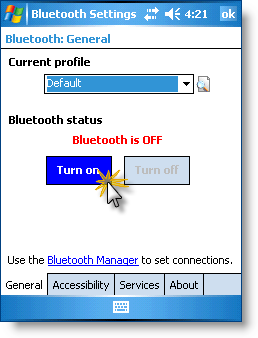 If your phone has Bluetooth, you can adjust the synchronization using this technology. 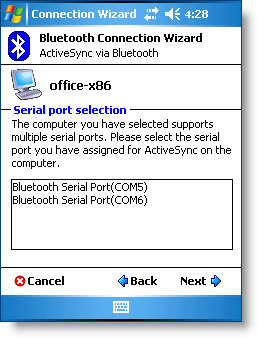 Of course, you also need to connect the Bluetooth-adapter to your computer and install the appropriate drivers for it. Description of the installation is outside the scope of this article and will not be considered here - see the documentation for your Bluetooth-adapter. Typically, the drivers supplied with the device and to determine their particular skill is not required. Fig. 12. Calling Device Manager. Fig. 13. Calling Device Manager. Make sure that under "Ports (COM & LPT)" is installed Bluetooth Serial Port. Port numbers may be different, just remember the smallest port number (in this example - COM5). 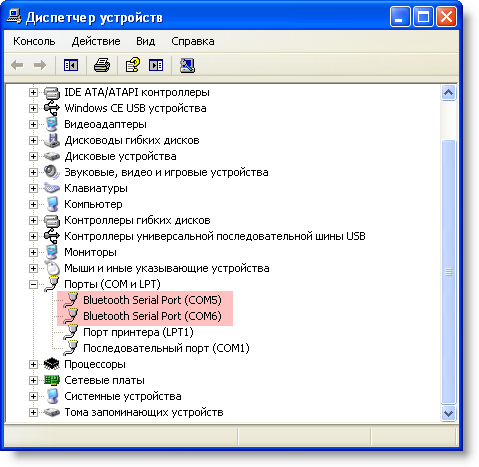 If the port does not, it means that your Bluetooth device was not installed the necessary drivers or they are installed incorrectly. In this case, the continuation of the settings can not be synchronized. Fig. 14. Ports (COM & LPT). Fig. 15. 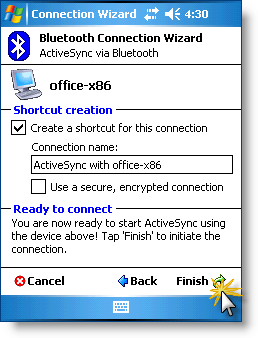 Windows ActiveSync® - waiting for connections. Fig. 16. Windows ActiveSync® - waiting for connections. Fig. 19. Setting up connections. Fig. 20. 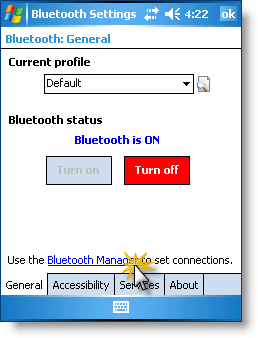 The inclusion of Bluetooth. Fig. 24. Connecting to the serial ports. Fig. 25. Completion of Connection to the serial port. Fig. 26. Create a shortcut to an established connection. Fig. 27. Connect using a shortcut. Fig. 28. Completion of the connection and start the process of synchronization through ActiveSync®. The following steps will not describe because they are completely identical to those described in previous section , starting from Fig. 2. 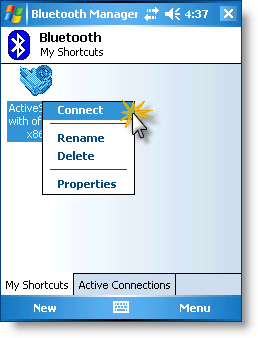 When configured in this way synchronization of the exchange of files between folders "My Documents" of mobile devices and documents to WINDOWSMOBILE29 "created on a computer specifically for your mobile device. If some mobile devices, each will create its own folder corresponding to the device name. article would like to remind you that it focused on the technical side of the synchronization, ie Configuring transport, ensuring the transfer of data between the computer, which provides access to the main accounting system and the mobile device, working with "slices of data" the main accounting system. The process of exchanging data at the application level is described in User Guide TCUMobile2 .